Thoracic disc injuries are not common. This is because the thoracic vertebrae and related structures are well protected by thoracic tissue so that the thoracic vertebrae have a limited range of motion. The incidence of thoracic disc injuries is 1 in 1 million per year. What is a thoracic disc injury? What are the causes of a thoracic disc injury? The disc in the thoracic area is a soft, round cushion that sits between the vertebrae (bony portion) of the spine. It is held in the space between the vertebrae by a tough ligament. In the case of a blunt force trauma to the spinal area, the ligament can be broken and the gelatinous disc material can spill out or herniate into the spinal canal or into the space where the spinal nerve roots exit the spinal canal to the periphery of the body. Thoracic disc injuries are rare because the thorax prevents considerable flexion/extension or lateral movement of the thoracic spine when compared to the lumbar spine and cervical spine. Forces causing a disc herniation need to be great in order to do damage to the thoracic disc. Such forces include a motor vehicle accident or a motorcycle accident, especially in cases where the individual is thrown from the vehicle, sports related trauma, such as with football or hockey incidents, or falls from a great height. A true herniated disc is most common in young adults and in those that are middle aged. In older people, the disc herniates less because of degeneration of the spine and disc that prevents the disc from herniating. Discs can rupture suddenly from a downward force, such as falling from a ladder or sitting hard onto a surface from a distance. A strong force will actually burst or fracture the vertebra. A lesser force will disrupt the annulus or ligament and cause a disc herniation. Even lifting something that is too heavy can cause a ruptured disc. Repeated small injuries to the annulus fibers will cause them to weaken to the point that a small force against the fibers will cause a rupture. It can be a really minor injury to the mid-back. This tends to be a greater problem in older people. When the disc ruptures or herniates, it generally pinches the exiting nerve root so that it causes pain extending from the thoracic spine down to the totality of the area the nerve root covers. Generally, in the thoracic area, the pain wraps around half of the trunk. In high thoracic nerve root injuries, a portion of the arm can be affected. 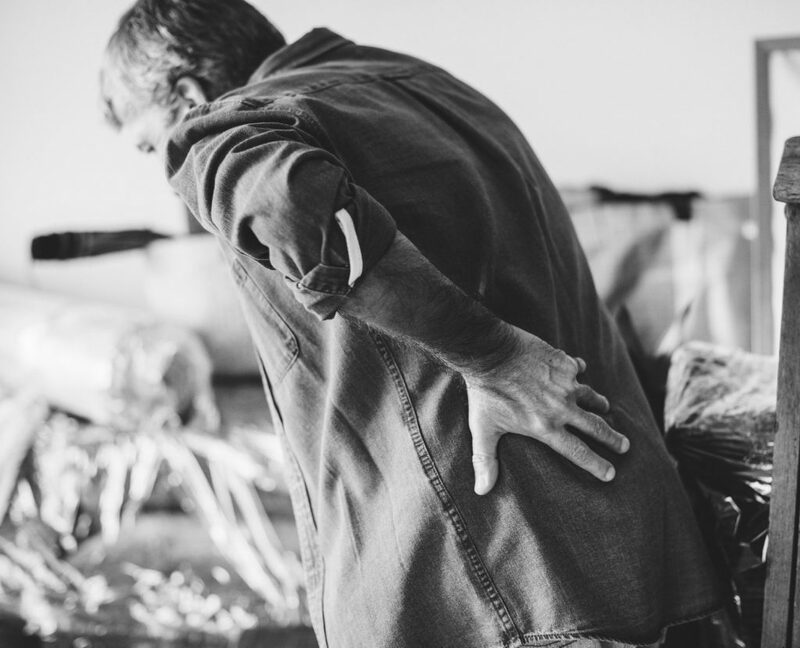 There can be degenerative disc disease in which there is gradual wear and tear on the disc over time so that the vertebral bodies are settled one on top of each other and the disc calcifies and becomes hard. It is usually seen between the fourth and sixth decades of life and the symptoms come on gradually. Patients often have the disease for a long time before they seek medical attention. Acute trauma to the upper or mid back. This requires a significant blunt force trauma that causes the sudden onset of back pain. The force can come from a fall from a great height, especially if you fall in a sitting position. Another cause of a thoracic disc injury is a motor vehicle accident or motorcycle accident. These tend to occur in younger people who don’t yet have any degenerative changes in the thoracic spine. Symptoms of pain in the thorax and radicular pain around the trunk can occur later with minor traumas but it takes the major trauma to have that happen. Most people who experience a thoracic disc injury will experience pain of some kind. The pain can be completely localized to the upper to mid back or it can follow a dermatomal pattern along a single nerve root. The pain in the back can be made worse whenever coughing or sneezing. Radicular pain may be felt in the chest or abdomen so that the doctor must rule out actual pathology in the area, such as is seen in problems of the heart, kidney, lung or musculoskeletal systems. If these are normal, the pain is radicular. Most likely, the pain will be located on one side of the body or the other. If the disc begins to herniate into the area of the spinal cord, the disc can press on the spinal cord, causing a myelopathy, which is a spinal cord function. This can be seen by having sensation disturbances like numbness of part of the body located below the level of the herniation. There can also be problems with walking and balance along with lower extremity weakness. There is the possibility of bladder or bowel disturbances. The doctor must rule out other disorders that mimic a herniated thoracic disc. These include having osteoporosis with a spinal fracture, infection in the spinal area, tumor pressing on a nerve root or spinal cord, and some types of metabolic diseases. Central disc herniation. The pain in this type of condition usually causes myelopathy and upper back pain. The cord is somewhat cramped in the thoracic area so it doesn’t take much herniation to lead to myelopathic pain. If the case is severe, a single herniation can lead to complete and total paralysis from the level of the injury on down. Lateral disc herniation. This means the disc has herniated to the side. It is likely to pinch an exiting nerve root heading out to the body. It often leads to radicular pain at the level of the injury. Centro-lateral disc herniation. This is a mixed type of herniation that combines the symptoms of central and lateral herniation symptoms. Any combination of symptoms of disc herniation can appear and the patient can have both myelopathy and radiculopathy. People can have a thoracic disc injury whether they are young or old. Young people can get a disc injury from a severe trauma. Those at risk are those who engage in high risk behaviors like driving too fast, driving without a seat belt, or driving recklessly with a motor vehicle or a motorcycle. Older people are at risk because of degeneration of the annulus or fibrous tissue that holds the disc material within the disc space. A minor injury can cause the disc material to spill out of the annulus, causing a thoracic disc herniation. Prior to doing any type of diagnostic test, the physician needs to take a good history of the symptoms and a thorough physical examination. The doctor needs to know the severity of the pain, the location of the pain, the type of the pain, and the presence of other symptoms besides pain. The doctor will assess whether or not there were other symptoms like fever, illnesses, weight loss or difficulty in urination that predated the injury or occurred since the time of the injury. The examination attempts to localize the lesion to the thoracic spine. X-Rays. These include plain films of the thoracic spine. While these types of x-rays don’t reveal the presence of a herniated disc, they do show signs of bony pathology and can tell if there is some kind of bony instability of the spine. MRI. The MRI uses a strong magnet to take images of the bones and soft tissue of the spine. Because it is so accurate and has clear pictures, it is a good test for identifying herniated discs. CT scan. This creates a three dimensional image of a body area using x-rays and a computer. It can show the presence of a herniated disc in the thoracic spine and can show if there is any bony injury as well. Myelogram. This is a good definitive test that involves injecting a dye into the spinal canal. X-rays are then taken to see if there is any spinal cord pressure or disc protrusion in the spinal canal. By far and away, most people with a spinal disc herniation in the thoracic area do not need surgery. They can make use of non-surgical measures that usually work to control the pain and inflammation of a disc injury. A brief rest period of just a day or so followed by activity modification that increases to the point of being able to do exercise as tolerated. The person can exercise in limited ways, like walking, to build up stamina over time. Narcotic analgesic medications for severe pain can be used for disc herniation. These tend to be used for a very short period of time as they can be addicting. Non-narcotic pain medication like Tylenol (acetaminophen) can be used for mild to moderate pain. It can be used for much longer periods of time. Nonsteroidal anti-inflammatory medications or NSAIDs take care of both the pain and inflammation of a herniated disc. Some patients can tolerate oral steroids for inflammation or COX-2 inhibitors like Celebrex for treatment of pain and inflammation. Patients can have an epidural steroid injection which can relieve the pain for up to a year if done correctly and the patient is lucky. Ice packs can be applied for twenty minutes at a time to the affected area. A chiropractor can do manual manipulation with relief in some individuals. You can do strengthening activities, including core strengthening procedures. Activity can be increased slowly over a period of 6-12 weeks as the symptoms gradually abate. Most people experience gradual improvement without having to resort to surgery using one or more of the above therapies. Surgery on a herniated thoracic disc can be done in those rare circumstances when the disc herniation is leading to progressive neurological deficits, myelopathy or horrible pain unrelieved by conservative measures. Usually surgery applies to those cases that are acute and traumatic, such as a fall or a car accident. The surgery performed to relieve the pain of a thoracic herniated disc is called a decompression surgery, which is done to take pressure off the spinal cord or the nerve root. A laminectomy is performed using a posterior approach and the decompression is done from the back. This is an older procedure not done now because it required retraction of the spinal cord, which doesn’t tolerate this procedure very well. An open thoracotomy is performed for central and centro-lateral herniated discs. The spine is opened through the chest cavity instead of posteriorly. Some centers have this procedure as a video assisted thoracic surgery, which is minimally invasive and doesn’t involve a large scar. Lateral herniated discs are generally managed through a posterolateral approach, which is called a costotransversectomy. A part of a rib and a transverse process are removed to expose the area that has herniated. The herniated part of the disc is then removed through that opening. 2 of the patients who did poorly underwent the costotransversectomy approach. Researchers felt that the better approach was the trans-thoracic approach. In another research study, the researcher showed a 76 percent satisfactory result when 29 patients had the Video Assisted Thoracic Surgery approach to their herniated disc. If you or a loved one has suffered a thoracic disc injury as a result of someone else's negligence and would like to discuss your legal options with an experienced Sacramento Personal Injury Attorney, contact us online or call us at 916.921.6400 to set up a FREE consultation.